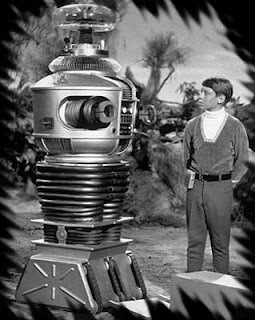 WARNING WILL ROBINSON: POSTS COMING! When I'm quiet this long, there's a lot going through my head.There's either one long post coming or a bunch of little ones. Sit tight ...and heed the robot's warning! * Adding a day to First Class Delivery. To recap: Slower mail delivery, fewer delivery days and higher postage will cure what ails what was once one of the marvels of the world, the USPS. Yeah, work that plan. It's a winner. At this rate, in ten years you'll be paying a buck to deliver it yourself. But you'll have to buy gas for the USPS truck first. I've spent most of the last two weeks either sick or very sick. The exception was this past Tuesday, where I seemed to be feeling great. So I overdid it. And ended up really, really sick because I am apparently too stupid to take care of myself. I could write a long, boring post about how crappy I feel, the joys of getting X-Rays and being harpooned, but I've decided to get back on the horse by writing about corn. My 2-year old grandson caused a small conundrum recently. He'd had a stuffy nose for a couple of days when my son called up and told his mother: "There's something way up in James's nose. It's yellow. It looks like corn." "It probably is corn," said my wife. After a few seconds, my son said it definitely did appear to be a rogue corn kernel. "He probably shoved it up his nose at dinner last night," my wife said. "We didn't have corn for dinner. We haven't had corn for a while." Next came the discussion about how best to extricate the offending bit of corn. Tweezers? Army Corps of Engineers? Tractor Beam? The E.R.? "I'm not taking my kid to the E.R. to have corn pulled out of his nose," my son said. My son was probably traumatized by the memory of our taking him to the E.R. as a child to see if he'd shoved a hearing aid battery into his ear. Turns out he hadn't but it wasn't a fun trip for him. My wife had a brainstorm. "Put some pepper under his nose," she suggested. Moments later, a sneeze and a splat. "Yup. It was corn. He's not stuffed up any more, either." So, mothers of America, here's today's health tip for you: If your kid is stuffed up, before you reach in the medicine cabinet and pump them full of expensive over-the-counter meds, stick some pepper under their nose and see what comes flying out. Yes, it might be good old-fashioned snot. But it might be corn, some peas, a lug nut or a malted milk ball. Be ready with a tissue and a catcher's mitt. You just might save yourself a few bucks and maybe you'll find that earring you thought you lost.